Me with Rabbit and my brother with Teddy. I still have Rabbit, you didn't think I got that name from nowhere did you? 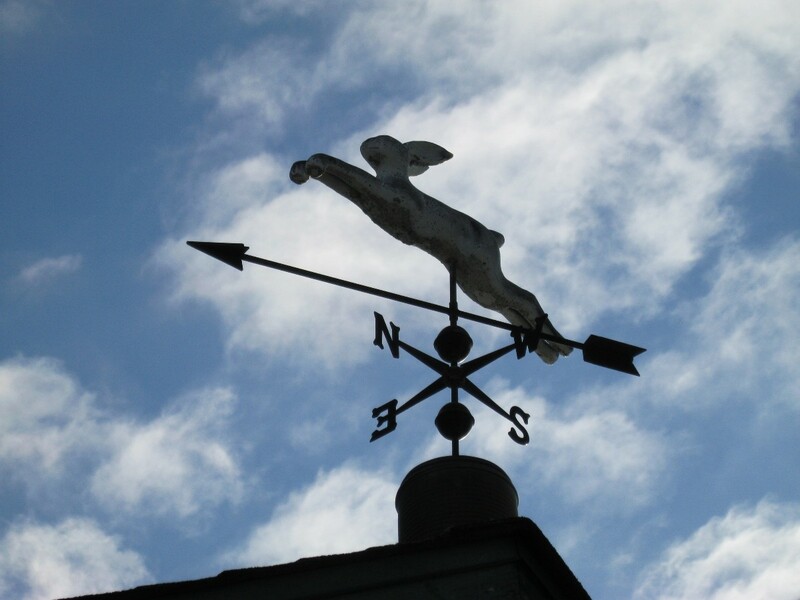 Writing about my family in a recent entry caused an absolute waterfall of memories including my rabbit memories. 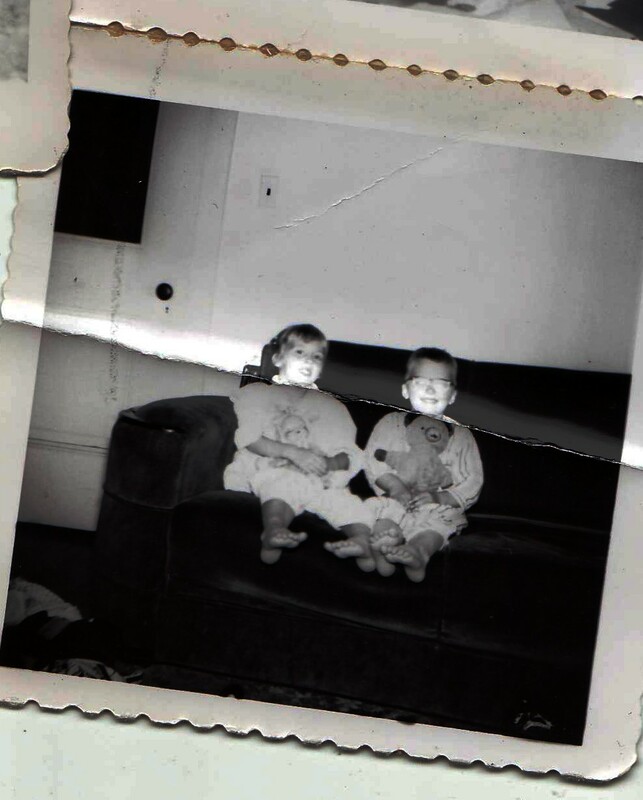 Here is a snapshot of my brother and me on the couch clutching our new stuffed animals with joyous smiles pasted on our little faces. My dad brought them home to us which is what made them so special. 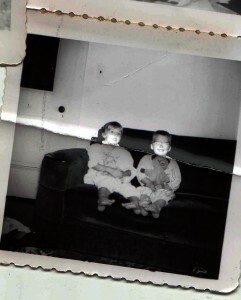 I remember the day I got Rabbit, I was probably about five and my brother was almost four. We named our animals the very original names of Rabbit and Teddy, and we still have them both. Teddy’s celluloid nose wore off from so much loving and was replaced several times by a nose made of black electrical tape. He wound up being Little Teddy because when Wayne went in for eye surgery he got Big Teddy. A classic old school bear from the fifties, like a carnival bear only bigger and softer. Isn’t it funny what we remember so clearly? The fact that Big Teddy had those flat eyes with the disks in the center that roll around and a yellow satin ribbon around his neck. Little Teddy had surgery at my inexpert hands somewhere around third grade, he developed a rupture right down the middle and I doctored him up for my brother with red embroidery thread, Franken bear. Rabbit originally had a string of bells on elastic, like white underwear elastic, coming out of her head with a little white disk to hold while you shook her. I did surgery on that too, insisted it be cut off first thing. Her tag says she was made by Gund and her real name is Jingle Belle. Nope, she is Rabbit. She has a strange plastic rubber smiling doll face with painted blue eyes and vacant smile plastered on it, and once upon a time she had woolly yellow bangs. That bunny sat on my bed until I was 18 and I pulverized her original foam rubber stuffing by crying so many salty tears into her hide. The original Rabbit still going strong over 50 years later. 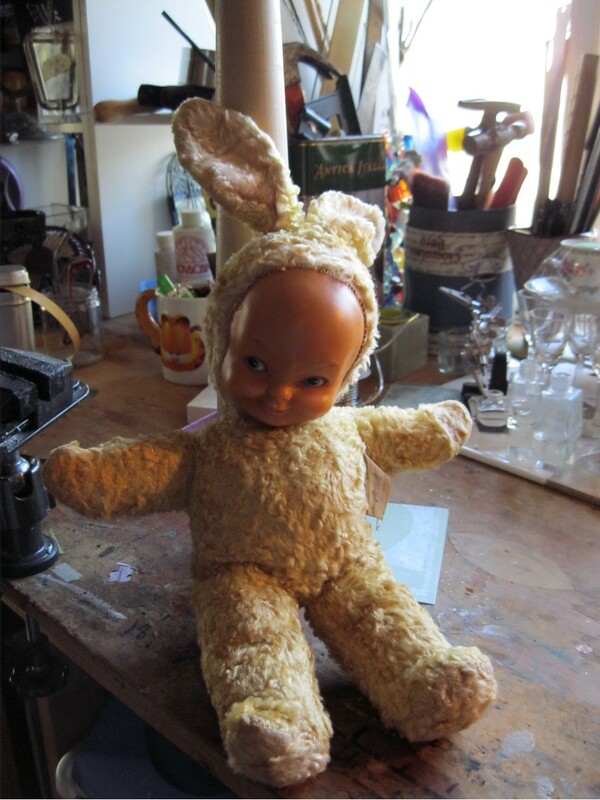 Rabbit was my shock absorber and I was happy to unstuff her several years ago, shake out the dusty old foam and launder her empty hide which had turned sort of yellow brown from years of growing up with me and then being shunted to a trunk. Eureka, she’s back, round and firm and fully packed. Even her face got a good scrub. She now holds a place of honor in my work space, Running Rabbit Studio. The first of many rabbits that hopped into my life. .She sits in a glass case next to another early rabbit that came into the world before I did. That bunny actually came from a carnival. My dad won it for my mom when they were dating. It was beautiful and white with a big pink bow around its neck. It had pink linings on it ears and they were wired to stand up straight. Round glass eyes and excelsior stuffing made her look like the Velveteen Rabbit. 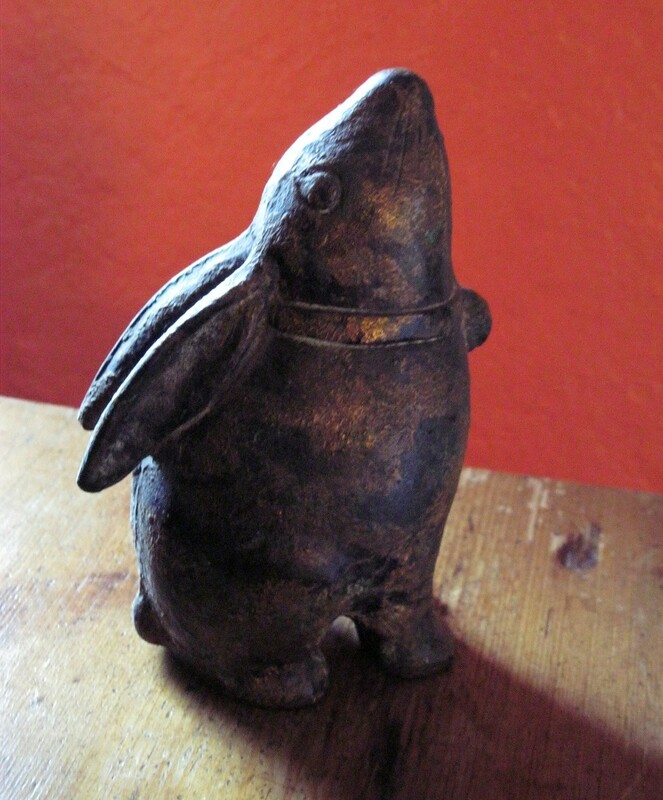 According to family legend from the time I could pull myself up I hauled that rabbit off my mom’s bed where it held a place of honor on a white chenille bedspread and dragged it around behind me. This rabbit would have been a great collectible if I hadn't worn it out and dyed it blue back in the 1960's! I found it in a trunk in the attic when I was about 12 where it had been put safely out of my baby clutches. This time, I snagged it and kept it. Over the years it got worn around the edges. The ribbon vanished, the white turned gray, the wires poked out of the ears, and it got a little lopsided as the excelsior shifted. In high school I discovered they were making aerosol fabric paint. The poor old rabbit is blue now, dark blue. The wires are long gone but I still love that 1940’s rabbit. 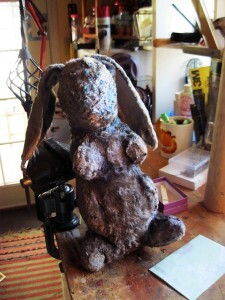 She is leaning on Rabbit in the glass case in Running Rabbit Studio these days. The next rabbit in the bunny chain is the Moon Rabbit. A bronze statue about six inches tall that I coveted when I worked for a Chinese art gallery in Houston. His head is tipped up and he lives in the moon, how quirky and delightful. Working in store was my first trip down the rabbit hole. Winston Chow, the boss, was from Shanghai and as tight as a tick. He had money coming out of his ears but parting with it? Not so much. He drove a big blue caddy that sounded like a threshing machine because he didn’t get the concept of maintenance for cars. He had a tiny little wife that he kept stashed in a tiny little apartment upstairs. The garbage was always full of teevee dinner boxes, I’m guessing the trophy wife couldn’t cook. The Moon Rabbit. I actually wrote a children's story about this rabbit and I am in the process of illustrating it now. When he was out of town she would come downstairs after my co-worker Jane and I figured out how to communicate with her. Seven years in the USA and no English. They went home to Singapore every year for two months on a buying trip and to visit his factories. He bought her clothes. She never went anywhere and never got to wear them but she had designer gowns that were breathtaking. She modeled the evening gowns for us and probably enjoyed the dropped jaws of her audience of two. She looked like a Chinese Barbie doll, tiny and perfect and I think so lonely. He bought her evening gowns but Winston wouldn’t furnish toilet paper or light bulbs for the bathroom so we had to bring our own, very odd. He bought a refrigerator for the old kitchen we used downstairs so we wouldn’t go out to lunch. I adored that place, it was fraught with beauty and mystery. It was also fraught with gay couples who were furnishing their expensive homes in all white or all black with lots of heavy gold Chinese ashtrays, gorgeous tables and massive Chinese bedroom sets. The Han people were very tall, so real Chinese furniture is pretty massive. We had a few chairs where my feet didn’t touch the floor when I sat in them. Working for Winston Chow was when I first encountered and fell in love with gay men, who knew there was an group of men who loved to shop? I learned a lot about Chinese furniture and knick knacks, things like there are not many pieces of Chinese antiques furniture around because the forests disappeared in China in large part centuries ago. Furniture was not wasted, it got taken apart and reused as new pieces. Funny how ecologically sound that was and now the Chinese are the biggest polluters on the planet. This entry was posted in Art is a tart, Life, the Universe and Everything, Uncategorized on February 21, 2011 by rox.